Once you have your mind set to getting a compact flashlight, there are some things you need to keep in mind when going shopping. After all, you don’t want to end up with just a regular compact flashlight, but with one that fits your needs and most of the situations you put it in. There are some small details that you need to consider as it’s not the obvious compact shape that gives you a good compact flashlight. First thing that many throw an eye at is the style of switching not so much because some would be better than others, but simply because you’d want a flashlight that is very easy for you to operate. Many think that the best choice in this case would the tailcap switches, opposed to the twisting head or the side switches. You also want for your compact flashlight to have a strong pocket clip that doesn’t ruin the overall slim profile of the flashlight. it wouldn’t hurt for the compact flashlight to also have a keychain hole, increasing its portability. Don’t let the typical smaller size of a compact flashlight fool you. Even though it’s small, it may still be bright and strong and it’s not impossible to find flashlights that give a maximum output of 1000 Lumens. Batteries are also important for a compact flashlight and those using rechargeable batteries seem to be the most popular. When you’re always out and running and don’t really have the time for charging batteries, you should get flashlights with batteries that are always easy to replace (AA and AAA batteries are easy to find). No matter what your final call is, it only takes a second to scroll down and give an eye to our choices. Who knows? Maybe the best compact flashlight for you is just a click away! 1). This may come as a shock to you, but even if you go shopping with just a few bucks, it doesn’t mean you have to come back home empty handed. You may still find a good, reliable compact flashlight to serve you well for quite some time. 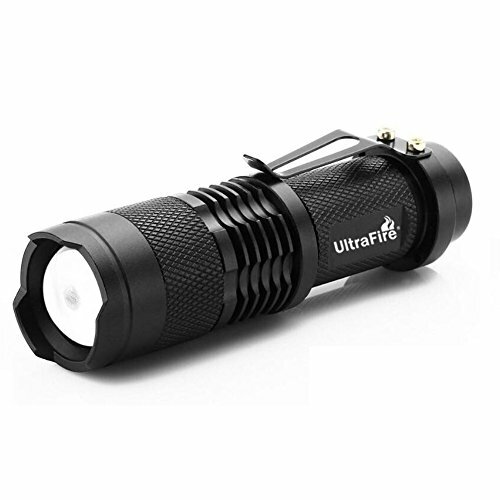 The UltraFire 7w 300lm Mini Cree Led Flashlight Torch Adjustable Focus Zoom Light Lamp fits the description and it’s an option to consider when shopping on a fixed budget. The flashlight is great to use especially when climbing, biking or spending some time outdoors. The little flashlight gives a 300 lumens maximum output and may even surprise you with its features. It comes also with an adjustable focus and zooming is pretty easy and smooth. You simply pull out the head of the flashlight, focusing the beam. But it’s not only the small size and good light that this little option is giving us. It also presents a skid-proof design and waterproof design LED bulbs. The body is tough, made with long lasting aluminum alloy casing and reflector The clip that holds tight and secure the flashlight is pretty strong, making it easier to carry around. As for power, you need one AA battery, but a 14500 battery may serve well also. Easy to use and to hold, the flashlight surprises with its heavy-duty build and good light it gives. Regardless of the minor issues, we still like this little powerful flashlight that brings quite a few good features to the table. 2). The BYB Super Bright 9 LED Mini Aluminum Flashlight with Lanyard isn’t just small and compact, but also so pretty looking as they come in a pack of 4 fun colors. The flashlight is a 9 LED mini aluminum type that truly fits in any pocket so it’s no bother for you to slip it in a bag/car/pocket and have it on you for emergencies. Despite the small size, the flashlight is pretty long lasting as it has a good build that takes the intense use. The durable aluminum body is quite tough and the flashlight takes a few splashes also since it’s water resistant. When we talk about performance, we’d say we’re pretty happy with the 30-lumens of light output that has a decent throw, up to 20 foot-away. The light is consistent and the batteries don’t run out fast. This takes us to the next good feature of the flashlight: you only need one AAA battery for operating it. this means that if you run out of the battery, you can find one in the next door shop on your way. The flashlight is very easy to operate and the tail cap push button is a great option for a compact flashlight. A nylon lanyard helps you carry the flashlight easier. Small, compact and bright- not bad for a cheap flashlight, right? No matter how you put it though, for the compact shape, good light and, why not, the cute looks, the flashlight isn’t to miss when you’re in need for a small one. 3). When you’re thinking about a compact flashlight, you want it to be small and bright in which case the J5 Tactical V1-PRO Flashlight – The Original 300 Lumen Ultra Bright, LED Mini 3 Mode Flashlight fits the picture. The flashlight is small, but this doesn’t mean it’s not bright or durable. As a matter of fact, the flashlight gives you 300 lumens light of output which may easily light 2 football field lengths on a clear night. The light travels far, up to 600 feet and the adjustable focus helps you zoom the beam in and out, for a more focused narrow beam. The flashlight has three operating modes (high/low/strobe) and it’s not difficult to go through the modes. But this is not everything we like about the flashlight. 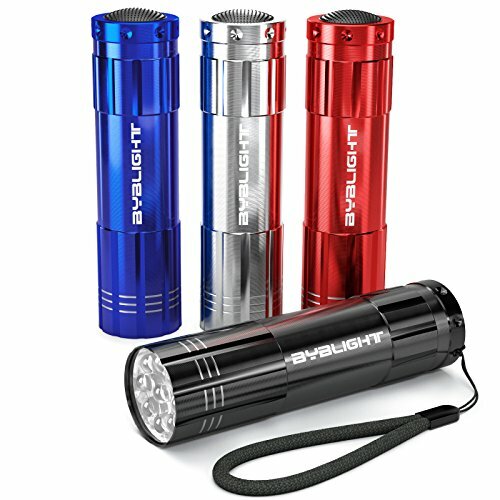 Its rugged build with an aluminum body gives the flashlight durability and ability to take many drops. The flashlight is there for you whether you go fishing or hiking. Additionally, the flashlight is water resistant, but you can’t submerge it under water. You only need one AA battery for the flashlight or a 14500 rechargeable one. This gives you better chances not to remain with no battery when out in the field. The metal clip is rugged and keeps the flashlight tightly for easy access all the time. The flashlight is very small, compact and so handy to have on you all the time. 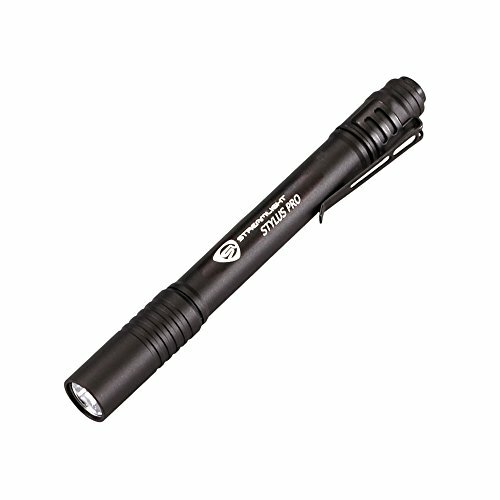 Nevertheless, as it’s small, bright and dependable, the flashlight is a great choice when in need for a compact light. 4). 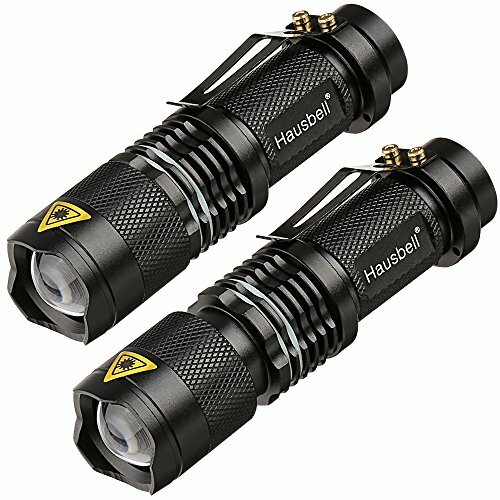 Dependable and bright, the Hausbell 7W Ultra Bright Mini LED Flashlight Tactical Flashlight (2 Pack) aren’t just small and compact, but also come for a great price. The flashlight isn’t bad when it comes to bright light and the 300 Lumens output is enough for emergencies and various situations. You may choose one of the operating modes, according to your needs: bright/ dim and strobe. The zoom is dependable and you may use it when in need. We also notice an adjustable focus that has a good range, making the flashlight more versatile. 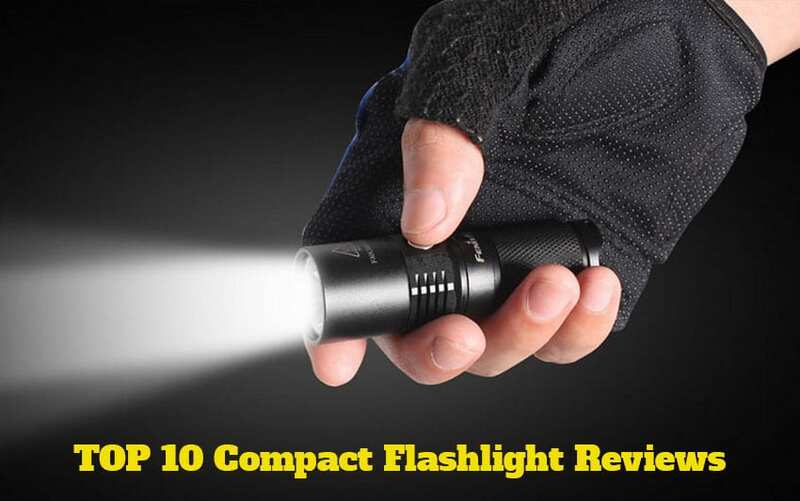 The body is made of aluminum alloy and this results into a durable, tough little flashlight. Furthermore, the flashlight is lightweight, fitting great in your hand or pocket. The little lanyards make it portable, whereas the magnetic back makes it easy to lock in one place and point the light to where you need it. You need one AA battery or 14500 rechargeable Li-Io battery to operate it. Easy to use and to adjust, the flashlight is solid and gets you out of trouble. All things considered, we think you’re definitely not getting a lemon and the flashlight is a great bang for your buck. 5). 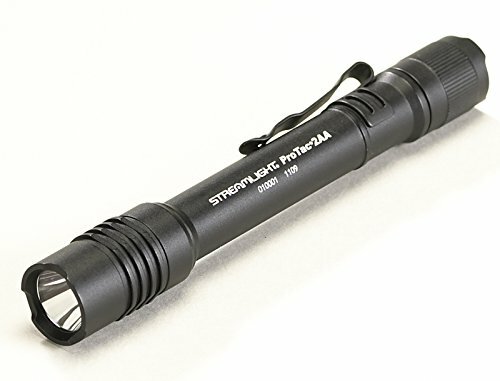 Even though it’s not the smallest flashlight out there, the Streamlight 66118 Stylus Pro LED Pen Light with Holster makes as a compact flashlight due to its slim profile and pen design. The flashlight fits any narrow place and small pocket so it’s a compact option for many. The C4 LED offers you 90 lumens light output and the throw is pretty good with the 60 meters. A good compact flashlight typically has a push button tail switch and the Streamlight 66118 sure has that. It’s also true that the button is tricky to push at times, but we still see it as a plus. The design of the flashlight is well thought-out and you may use the momentary or the constant on operation. The body is another great plus for the flashlight. Made from anodized aircraft aluminum, the flashlight handles the intense use and some falls. The body is abrasion and scratch resistant and the risk for corrosion is minor. Let’s not forget to mention the flashlight handles a pouring rain as it’s IPX4 water resistant. You shouldn’t worry about dropping it, as long as it’s not from more than 1.5 meters. As for portability, the flashlight is also well-equipped. It comes with a tear-resistant nylon holster and a removable pocket clip that is strong. The flashlight is protected, no matter how you decide to carry it around. Well-made and giving you a good deal of light, the flashlight has its place in our selection. Long story short, for the slim profile and reliability, the flashlight still comes across as a compact option for many. 6). What we like the most about the 1000 Lumens Tactical Flashlight, Asben T6 High Powered Handheld Torch with Rechargeable 26650 Lithium Ion Battery and Charger, is the fact you get a whole package for just one price. 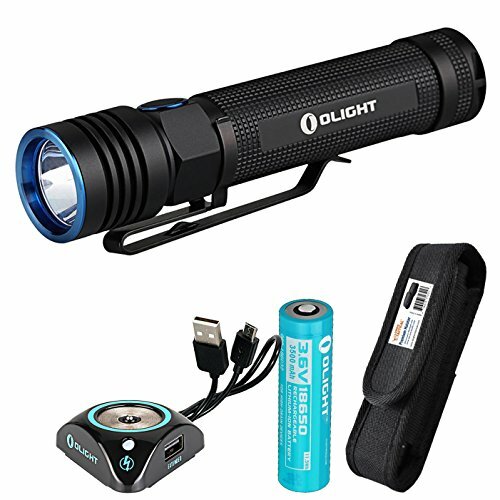 You get not only a LED flashlight, but also a 26650 rechargeable Li-Io Battery, a battery charger, one AAA Battery holder and a user manual. The flashlight gives you five operating modes to choose from when in various situation: full brightness, medium, low, strobe and SOS. The full brightness has an 1000 Lumens light of output. Along with the five operating modes, you also get to use the adjustable focus with an efficient zoom function and an adjustable focus range. You may definitely rely on the spotlight and the floodlight functions when you need to. The beam has a good throw, up to 500 meters. The tail cap switch is responsive and easy to operate. Going through the 5 light modes is easy every time. You may operate the flashlight with one 26650 battery or four AAA batteries. The narrow beam, the ability to program and customize the flashlight are its main strength and the flashlight is an option to have in mind. Despite these minor foibles, we think you can’t go wrong when getting the flashlight. 7). Easy to use especially in any tactical situation, the Streamlight 88033 ProTac Tactical Flashlight 2AA with White LED may be the last detail to complete your tactical gear. The flashlight is long lasting and so easy to use. It’s compact and strong and presents C4 LED technology which explains the brightness. The multi-function ability and the rubber push-button tactical switch lets you one-hand operate the momentary and all the other light modes on the flashlight. The Ten-Tap programmable switch helps you set it just the way you want it in a situations: high/strobe or low. You may also set it for high exclusively or low/high. The highest output is 250 Lumens and the beam has a fair throw. We also notice the anti-roll face cap and the pocket clip that is easy to remove. The flashlight is portable and stands on its own if you want. The nylon holster protects it, expanding its life span. The flashlight is build tor the challenging tasks and not only has an anodized aluminum body, but also features tempered glass lens that is impact-resistant and O-ring sealed. You may use the flashlight under water to 1 meter, for 30 minutes since it’s IPX7 waterproof graded. The flashlight handles a drop, as long as it’s not more than 2 meters. Compact, reliable and strong, the flashlight is worth every single penny. Nevertheless, for the rugged build and compact shape, the flashlight could complete any tactical equipment. 8). If you don’t want to spend too much time when searching high and low for the best compact flashlight, stay on the safe side and give it a go with the SureFire G2X Series LED Flashlight. It goes without saying that the popularity of the flashlight comes from its overall quality and its fair price, as well as the recognizable Surefire brand. 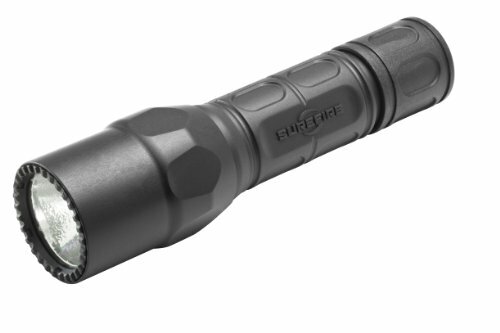 The flashlight presents a rugged body that is made with tough Nitrolon polymer and Mil-Spec hard-anodized bezel. Not only the flashlight takes the intense use, but handles well a few drops as well. The polycarbonate window matches the rugged build as it’s tough and impact-resistant. Add the weatherproof o-ring and the sealed gasket and you’re getting the popularity of the flashlight. farthermore, you may use the flashlight in an impressive range of temperatures thanks to the built-in heat and fault protection. As for the light modes, you may use the maximum of 320 Lumens or the low of 15 Lumens, when you want a longer runtime. The beam is nice and clean due to the parabolic reflector and the light has a good range cover. It’s very easy to use the flashlight and the dual-output tail cap click switch is fast and responsive. The risk for accidental operation is minor as the switch isn’t too sensitive. We really like how the flashlight feels in the hand due to its ergonomic design and compact shape. For the rugged build, reliability and good light, put your money at stake and get the flashlight. 9). Powerful and compact, the Olight S30R Baton III 1050 Lumens EDC LED Rechargeable Flashlight gives you a maximum output of 1050 lumens, which should be enough for all sorts of situations. The flashlight is small and has a good weight, becoming a great option for EDC tasks. The clip is sturdy and strong so you may carry it everywhere and the magnetic tailcap lets you easily attach it to metal surfaces for comfortable hands-free use. Let’s not forget the lanyard that increases its portability or the holster that protects it. The versatility of the flashlight is impressive as it comes with a rechargeable 18650 battery, USB cable, and USB charging dock. The light is bright and the beam has a nice pattern. The throw is good, up to 205 yards. The batteries run forever and the flashlight manages to be efficient, despite its very simple design. it doesn’t get hot thanks to the thermal management program and the flashlight is so easy to operate. The list of good things isn’t over and we also have to mention the low power indicator that is comfortably placed under the side switch. The memory function completes the list of good things. The flashlight is water-resistant and handles very well a few drops. No matter the inherent downsides, the flashlight still stands as a rugged, compact option for any tactical use. 10). 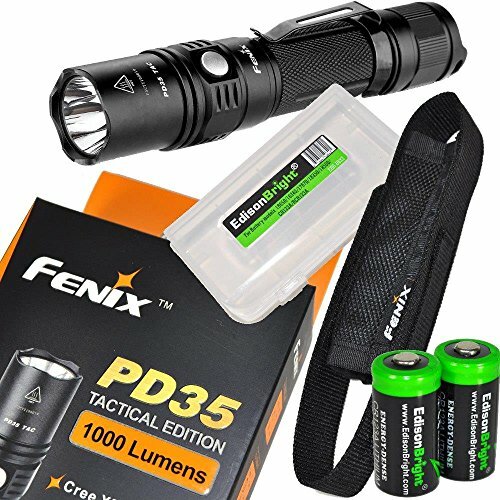 Get ready to enjoy the very bright light of the Fenix PD35 2015 TAC Edition 1000 Lumen CREE XP-L LED Tactical Flashlight. the flashlight is compact and small which is why it’s an ideal choice for the tactical missions. The 1,000Lumens output should be more than enough to light up your way in the darkest night. The Cree XP-L (V5) LED isn’t just powerful but also durable as it lasts up to 50,000 hours. The flashlight is easy to use and the tactical tail switch helps with the compact profile of the flashlight. You need to use one 18650 Li-Io battery that is rechargeable or 3V CR123a Li batteries. The flashlight also features a low-voltage reminder that lets you know when it’s time for a recharge. Farthermore, a reverse polarity protection protects your flashlight when the battery isn’t well placed. The list of good features continues with the intelligent memory circuit and the memory function. The flashlight automatically enters the last output mode, which is quite handy in some situations. The body matches all the great features as it’s made with aircraft-grade aluminum with Premium Type II hard-anodized anti-abrasive finish. This gives durability to the flashlight. the anti-roll body design ensures a steady grip and the flashlight is slip-resistant. As for the lens, it’s nice and strong and the anti-reflective coating gives a nice beam. You may take the flashlight under water up to 6/12 feet for 30 minutes as it has an IPX-8 waterproofness grade. The hot spot, the nice flood increase the performance and the flashlight satisfies so many various needs. Despite the cons, we still like the flashlight for all the good things it brings in such a compact size.